6 Important Tips for first time Discover Scuba Diving (DSD/ Try Dive) participants. So you are going to the Andamans (or any other diving destination) and you want to have a great experience for your first dive (aka, a Discover Scuba Dive or Try Dive) – how do you ensure that? In theory, diving courses all follow more or less the same procedural standards. However, in practice, there are enormous differences between the same program, conducted to the same standards (hopefully! ), just as 2 different schools, both following the same curriculum, can have very different teaching outcomes. 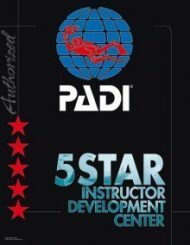 While the program is standardized with international standards, how it conducted and the experience/attitude of the instructor conducting the program makes a big difference in the quality of your dive program. And how the program is conducted also matters – does it follow a “one size fits all” approach or is the program tailored to account for each person’s comfort level? So here are a few tips that you can follow, to ensure that you have a great experience for your first dive – one that you will rave about to your friends for a long time, or even hook you to the sport for life! What do you want to get out of the program? Do you just want to check it off a list, and perhaps get a few photos for social media but nothing beyond that? If so, pretty much any dive shop will do. However, doing that is selling yourself short, in my opinion. A good diving experience is *magical* – you are weightless in the water, a sensation similar to flying, and are surrounded by lots of fish and marine life, seeing more action in an hour than you would in a week on safari. If you are going through the program, why not try to have a richer experience, where you are an active participant in the program, as opposed to just passively being dragged around for 15 min? The sad part is, because beginners don’t have any basis for comparison, they typically don’t realize how much they are missing out when they do such a bare-bones passive program – its the difference between seeing animals in the zoo vs being on safari. Sounds obvious, right? But be careful if you are on a package trip with diving included – a mainland-based Andamans holiday operator does not know much about diving, and only cares about signing with an operator who provides the lowest possible rates (and some of those trade rates go very low indeed, with agents using competition among diving operators to their benefit). So while you may be paying the regular price for the diving, but there can be a big difference in how much a dive center actually earns from the dive. A reputable dive shop sets its program standards first, and then sets a price for it, knowing that dropping the price too low will mean a reduction in quality. However, as diving grows in popularity, there are enough operators chasing the money, who are willing to offer diving at cut-rate prices: and guess what that means you get? A sub-standard diving experience. In many parts of the country, this means dives are led by people who are barely qualified as divers, let alone being certified dive professionals (a requirement to conduct any scuba program with beginners). They have minimal knowledge of safety procedures, or even how to make the experience more fun and enriching. And if something goes wrong, it is your safety that is at risk. So always ask if the dive center itself is accredited with an agency and check to see the qualification card of the person conducting your program – it should read Instructor or Divemaster, depending on the program. Anything less, and you dont have a qualified person leading your dive. What we wrote above about mainland-based travel agents holds doubly so for local agents or taxi drivers. Atleast the mainland agent has taken your money and perhaps wants to build a longer-term relationship with you as his client. The local agents or taxi drivers will be motivated entirely by the commission they get from the dive center with zero interest in making sure you have the best dive experience possible. We have heard some amazing yarns being told by taxi drivers about other dive centers in an effort to convince their clients to go to the dive center of their choice. Do your research online instead. If you have seen a safari jeep crammed with 8 people and being driven around by disinterested guides, vs had a private jeep with an experienced naturalist, you know how different a safari experience can be, even when conducted in the same area and seeing the same things. Similarly, even when a dive center is reputable and follows program standards and has qualified dive professionals, there can be a big difference in your experience. The first thing to check for is – does the program follow a cookie-cutter formula (5 min to put on gear, 10 min to do skills, 10 min out, 10 min back, done) or is it customized to take into account each diver’s comfort level? If you are comfy in the water, the former may work for you. But if you are nervous, or more interested in specific marine life, a more customized program may be a better option. Now obviously, there are limits to how much customization you can get before the price increases significantly, but at the very least, the dive shop should be prepared to spend more time and tweak the program a little for nervous divers, for example. – Is the program being conducted by agency standards (PADI or SSI)? – Is your program registered with the agency (this has some benefits to you, not the least being that it makes your program auditable for adherence to training standards)? – Does the dive shop maintain a compressor log and change the filters regularly? – Do you complete a full set of paperwork, do you get a detailed briefing (video or verbal) explaining the program, the basic theory behind diving and also the risks (so that you can make an informed choice)? – Will you get enough time to practice the skills yourself and get comfortable? Also, trust the vibe you get from the dive center! You are doing this for fun, and the dive center’s vibe should match your own expectations for how you want to spend your day. If you want a relaxed program, and the dive center is very strict about timings, process, etc., then even if they conduct a very thorough program, you won’t enjoy it as much. Or vice versa. Yes, it may be a little self-serving for us to be writing this, but honestly, we’ve all been (and still are) on the other end of this equation: we all go on diving holidays as well, and one thing none of us do – despite being professionals with thousands of dives under our belts – is pick a dive center based on the lowest cost. Do you pick schools or hospitals purely based on price? If you are going to spend tens of thousands of rupees – or more – to fly all the way to the Andamans, then trying to save a few hundred rupees and picking the cheapest operator (see point #1 above) is false economy. Focus on finding a dive center which is professional, has qualified dive leaders and which has a vibe you enjoy. It is better to spend a little more and have a great time, vs saving a little and not really enjoying yourself. Diving is a sport where the costs are fairly standard worldwide (dive professional salaries are similar across the world, dive gear costs the same and so on), so prices are fairly standardized in similar destinations (eg, popular high-volume destinations tend to be similarly priced, remote locations tend to be similarly priced, and so on). If you are getting a price that is significantly lower than average for the destination, then be suspicious. Diving is a safe sport and for Discover Scuba Diving / Try Dive programs, the medical requirements are quite minimal. But there are still a few medical conditions which, in some cases, can increase your risk in diving – only your doctor is in a position to determine if those risks are applicable or not. Not the dive center. So if you answer “yes” to any of the listed medical conditions, reputable dive shops will not take you diving without a doctor’s clearance. Please don’t argue this decision – if a company which earns money from taking you diving is refusing to do so, on the grounds of safety, they have good reason to for this. And it involves YOUR safety. In a lot of these cases, a doctor’s clearance solves the issue. So if you have any pre-existing medical conditions, contact a dive center before your trip for a medical form, show it to your doctor and get a clearance before coming to the Andamans. Diving is not rocket science. All it takes is a desire on your part to experience the underwater world, and a commitment on the part of the dive professional to ensure that you have the best possible time. Sadly, that is not the case and too many people leave the Andamans having gotten an experience that is only a fraction of what could have been. Which is a shame – a properly conducted program should wow you, and leave you raring to dive more. Here at Diveindia, our programs are conducted by dive professionals, who have spent several months assisting after getting their pro certification before they take divers out independently. We are owned and operated by divers, not businessmen sitting in a remote office, and we want to make sure you have such a great time that you continue your diving journey after this by doing a certification course and becoming a trained scuba diver. Our programs are conducted one-on-one, based on PADI Discover Scuba Diving standards, and yes, you are registered with PADI at the end of the program. Whether you dive with us or someone else, we encourage you to do your homework and support a professional, competent dive center. You will have a better experience as a result.